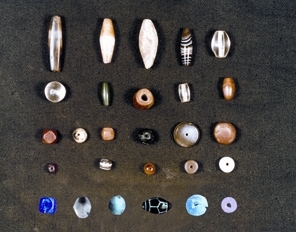 The variety of different styles and types of beads displayed on this page shows how skilled and highly advanced the Burmese bead makers were. Following several bead-websites, within the last five years, I have noticed a peculiar thing. 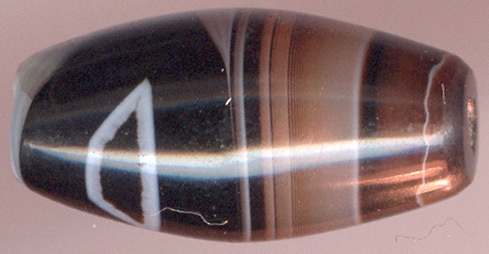 All beads from Burma have been renamed 'Pyu/Tircul' beads. This is an oversimplification. No doubt the Pyu/Tirkul culture has played the major part in bead making in Burma. 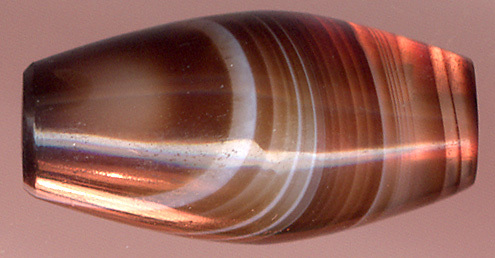 However, bead making has been done in many other different areas and time periods in Burma. To call all beads from Burma Pyu/Tirkul beads also overlooks the fact that there has been a great exchange of beads between India and Burma due to trade and their common Buddhist culture. Most probably this oversimplification has happened because it has made it easier to brand and sell beads from Burma to a new, primarily eastern based middle class without too much historical and cultural interest in deeper and more complex explanations. The beads you see displayed below were found as a lot in India, Punjab, in a ruin on the countryside near the Pakistani border. 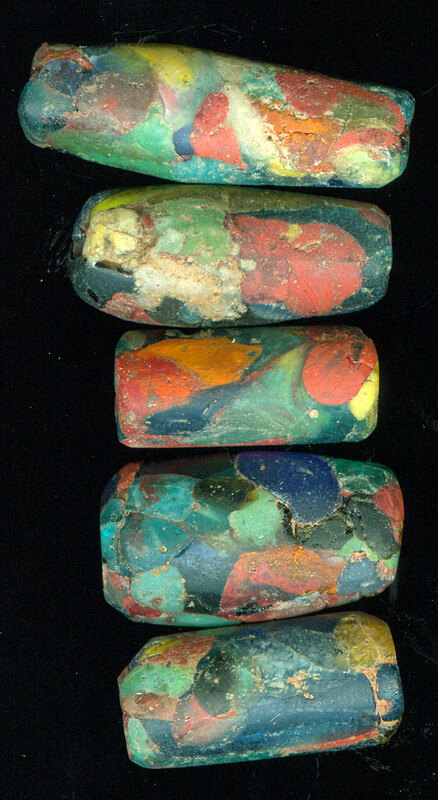 They are burial beads or at least they were never used. 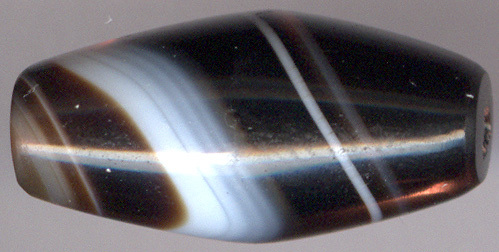 However you can observe how some of the beads have a slight dis-colorings from the surrounding earth. How they ended up in this godforsaken place far from Burma is a bead-mystery. It was my good friend Professor Bhandari who found them on his lifelong search for ancient coins all over India. Mr. Bhandari, now not more among us, was a passionate collector of ancient coins. In his search for coins he often also got beads from the small boys living close to archeological sites. These boys were earning a little extra money from visiting collectors like Mr. Bhandari. Professor Bhandari's coin hunting season always started after the monsoon period, where the rain had washed the earth away, and in this way made new discoveries possible. It was the Professor's small collection of beads, which he gifted to me, that inspired me to become a bead collector. 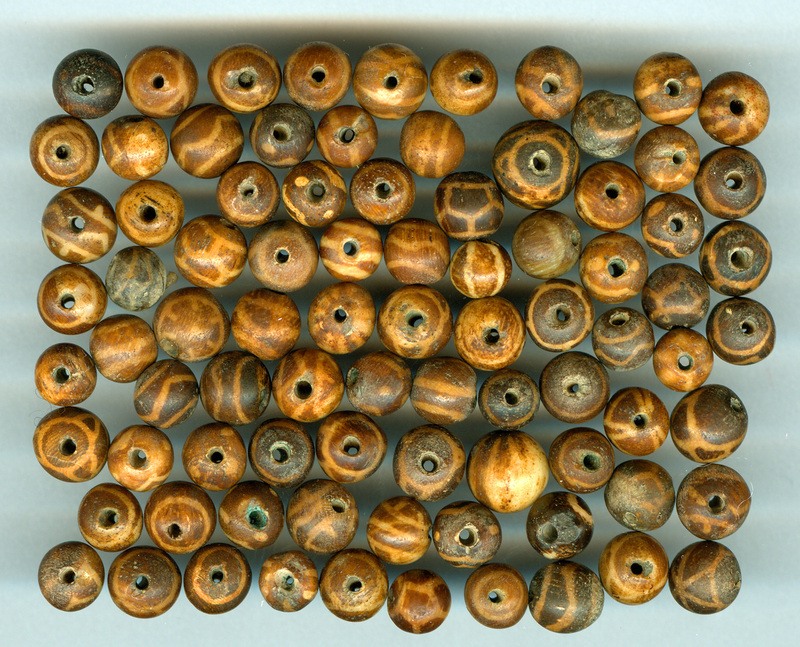 Pumtek beads, also called buried thunderbolt beads are important heirloom beads among the Chin who live in the Chin Hills of western Burma/Myanmar and the adjacent area of eastern India, where they are called Kuki. The original Pumtek beads were made over 1000 years ago by the Pyu, the builders of the first city states in Burma, but somehow the Pumtek bead art survived in the mountains, far from the fertile rice plains of Bagan in its heydays. 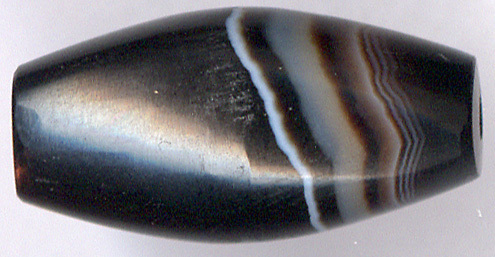 Ancient Pumtek beads are often small, often made of the opalized wood of the palm Borassus flabellifer. 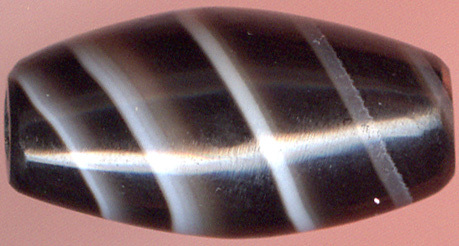 This type of beads will fluoresce under a short-wave UV lamp. 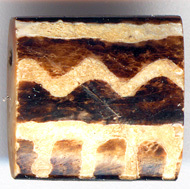 Instead of opalized palm wood many Pumtek beads are made of other forms of petrified wood - often in the form chalcedony. Still, they can be ancient. 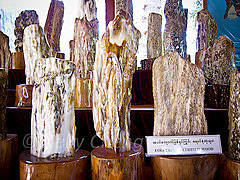 Petrified wood originating from all kinds of wood can be found all over Burma. 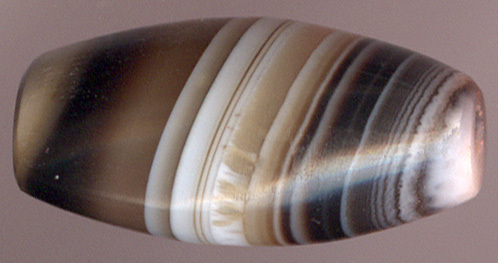 It is only natural that ancient bead makers (as well as contemporary ones) have chosen this beautiful material. As you can see from the above photo, the original form and structure of the wood is preserved in a form of a woody grain. 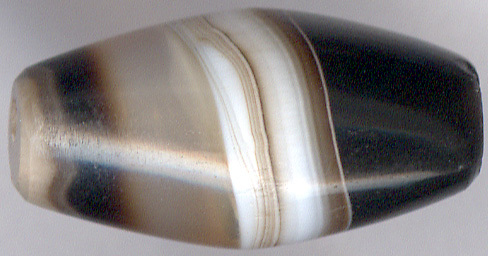 Many Burmese beads are made of petrified wood. 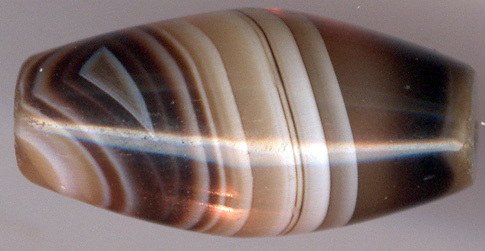 These ball beads were sourced from the Bagan area. 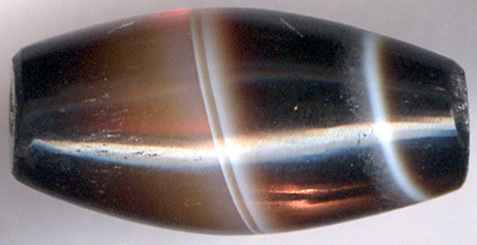 They are high-quality antique production beads from the early 20th century. 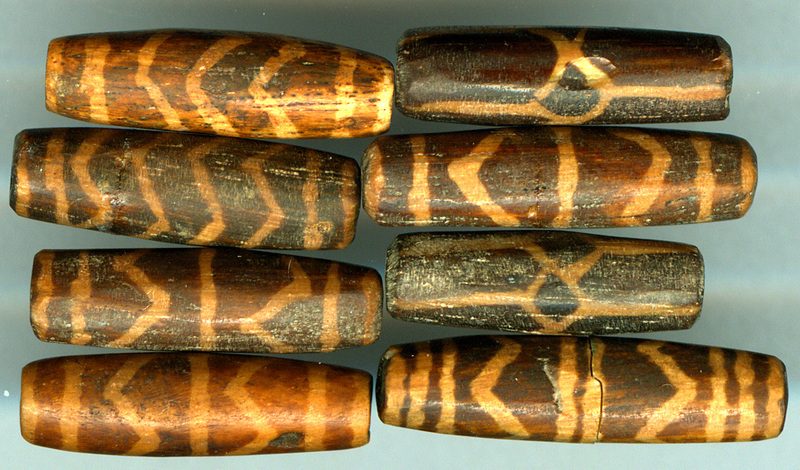 These small Pumtek beads are from the Chin state. The workmanship is very delicate. 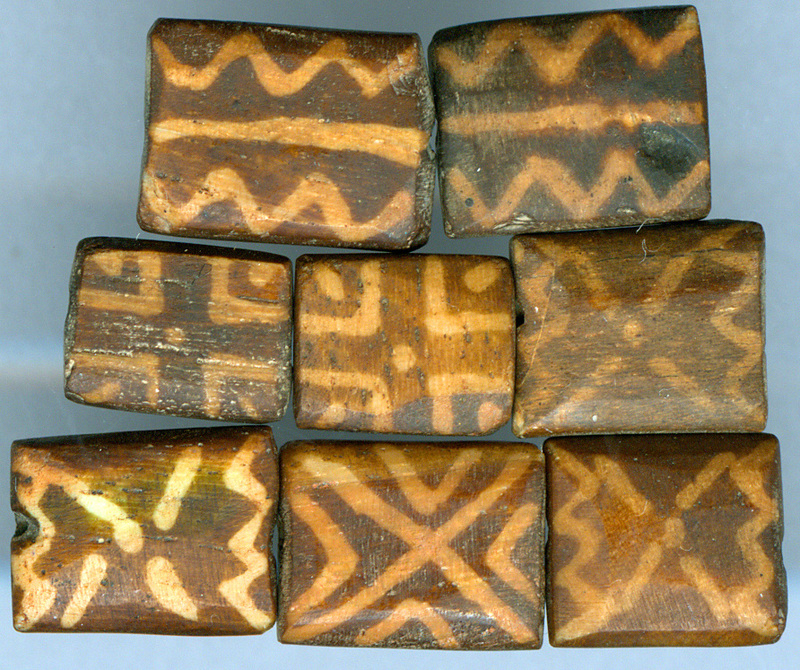 The man I got them from told me that they were not original Pyu beads, but Chin 'copies' made around 500 years ago. According to him the original Pumtek beads from the Pyu city-states have been made continuously for the last 1000 years in the Chin area. 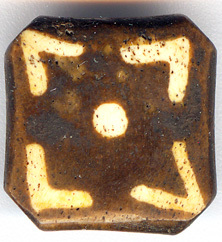 This ancient Pyu bead has been 'repaired' by cutting off the ends of the bead. The repair itself seems to be quite old. 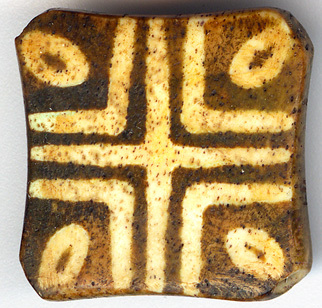 Square ceramic beads with the typical Buddhist cruciform pattern. 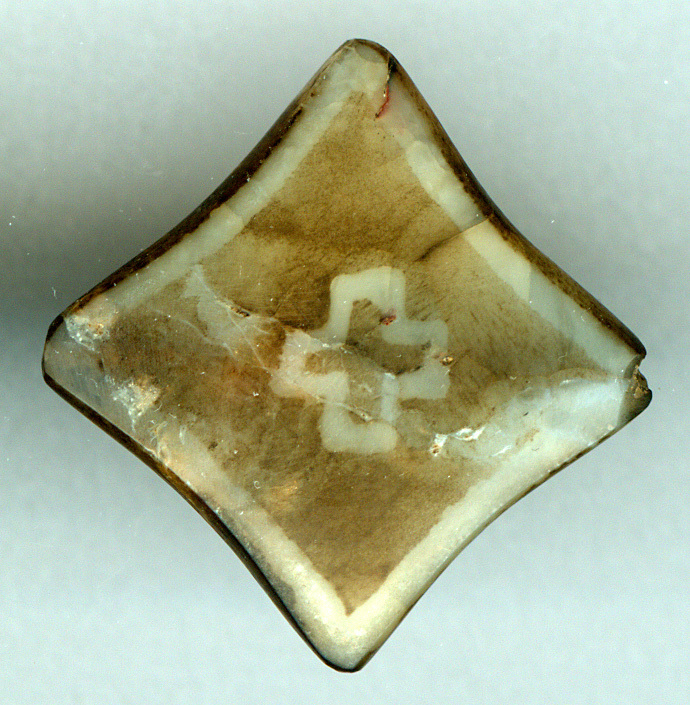 When I showed this bead to a Tibetan expert dealer in DZI-beads in Kathmandu, he said that this bead was a very ancient form of Tibetan DZI-bead being capable of preventing stroke and brain hemorrhage. 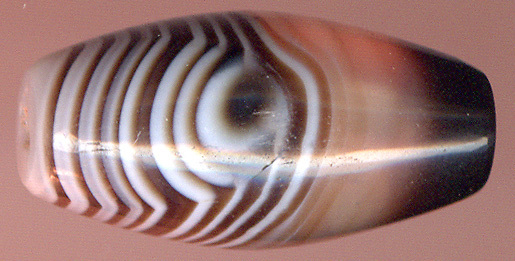 Note the many formations of eyes. 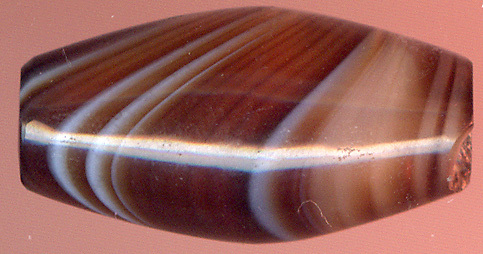 You can see my wonderful small collection of zoomorphic beads from Burma by clicking here. 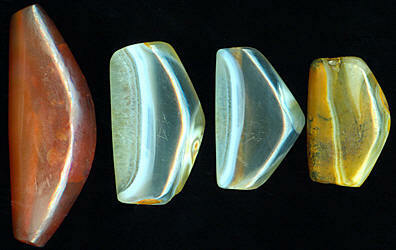 You can see more infomation plus detailed scans of these wonderful beads here in the Carnelian bead section. You can see my collection of wonderful Burmese etched beads displayed here. Here I will only display a few. Here you can enjoy a large wonderful Jasper bead with 3, 5 and 3 white stripes. 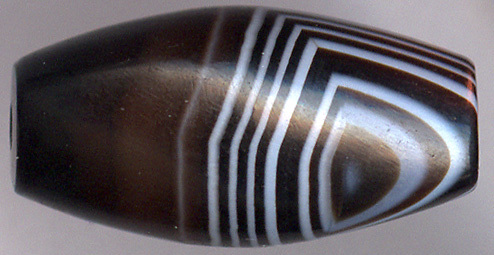 The white stripes in this big red Jasper bead seem not to be etched into the bead. They are almost carved into the surface. 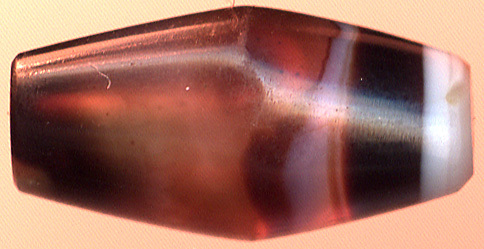 This ancient carnelian Pyu bead has been colored by oil, gas, and pressure. You can read more about it here. On the net these kinds of beads are presented as military beads. I find it odd that a peaceful Buddhist culture like the Pyu's would have so many beads with military symbols. 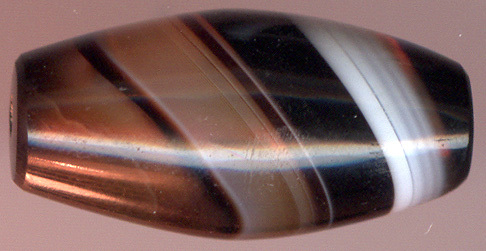 Stripes on beads, especially carnelian beads, are found everywhere in Greater India. 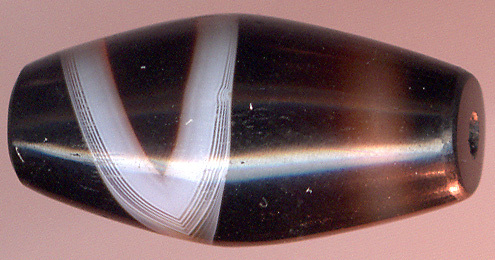 The stripes most probably indicate animistic magic properties in a Buddhist context. 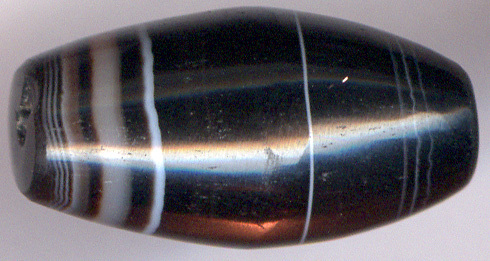 However, particular this bead is typical for Burma and not for India. 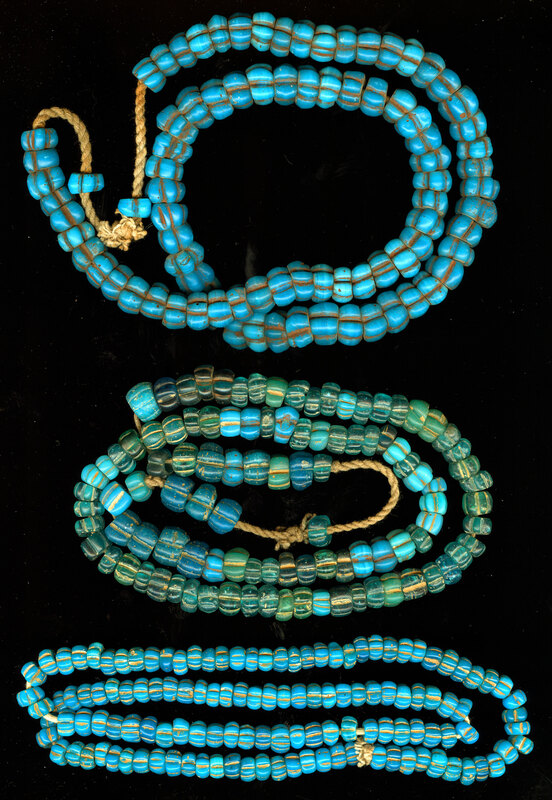 These exceptionally beautiful Sulemani beads look like new beads. 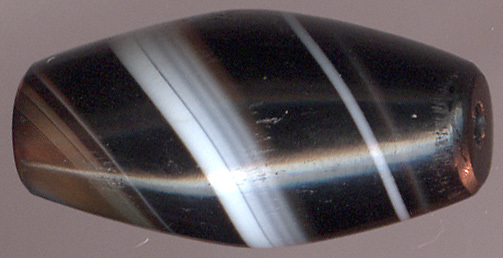 I have not seen such colors, in a play of black translucent stone and banding as one can observe in these beads. They are all hand-polished and oil cooked. 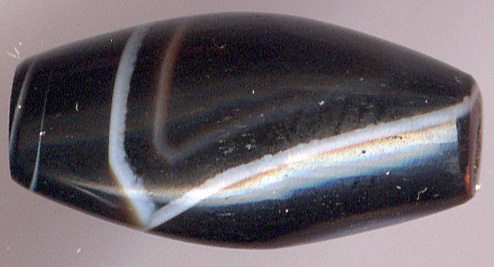 The shine of the many of the beads still have oily reflection colors. 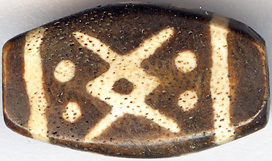 A close examination of the holes and the surface of the beads shows that they have not been used. However, they are ancient, displaying the most wonderful excavation patina with a lovely soft sheen. They have been stored away as precious jewels in a long forgotten and destroyed burial site or they have been put in a Buddhist relic casket from and old Stupa. 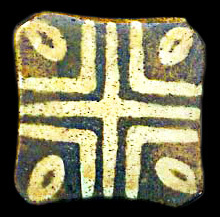 You can read more about excavation beads here. I marvel at this ancient skill of letting the artful patterns emerge out of the raw stone. These beads are most probably a product of Burma's own craftsmen. 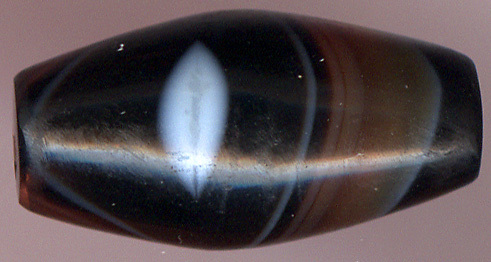 I have singled this bead out of the lot because of its exceptional beauty. 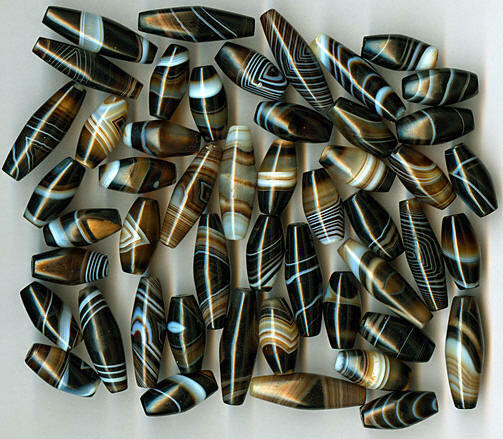 In this lot of Buddhist Burmese beads, we find from black onyx with white stripes to more like traditional translucent agate beads with swirling motives in various other colors. You can here compare the black onyx bead SM 142 with SM 156. 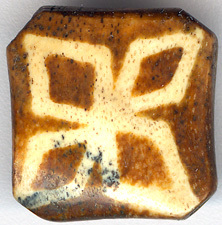 The only place where I have found something similar to these outstanding beads is on a site with beads from Bangladesh. 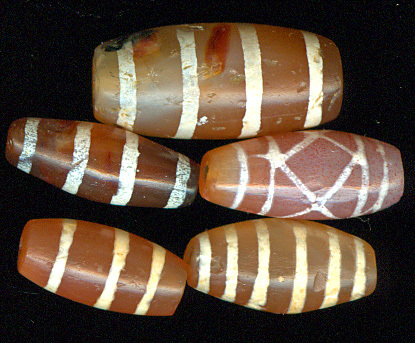 Ancient beads from Mahastan, Bangladesh. Pease also note that the daylight color of the beads is most correct displayed in the above photo. In the series of pictures below, I have tried to make the translucent nature of the beads come forward through a secondary light source. 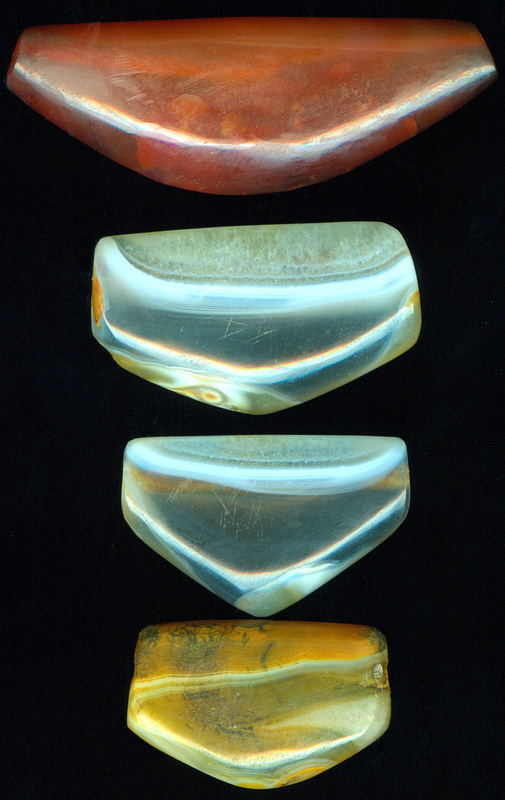 These Pyu glass beads are made in resemblance of the typical Burmese jade. 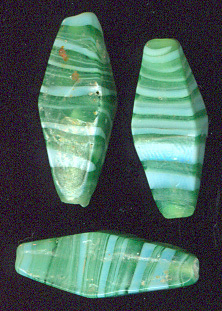 These wonderful blue glass beads are from the Burmese part of Naga Land. They are around 100 years of age, made in India as copies of the much sought after Venetian glass pearls. 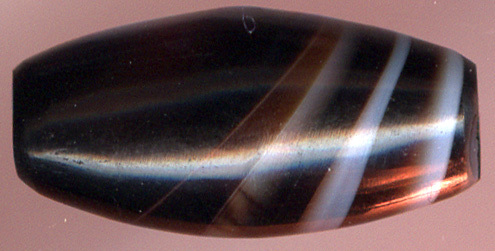 These old Indian copies are not refined as the original Venetian pearls. However they have their own charm in their more 'primitive' design. The most spectacular and beautiful beads from Burma originate mostly from the Pyu city state culture. 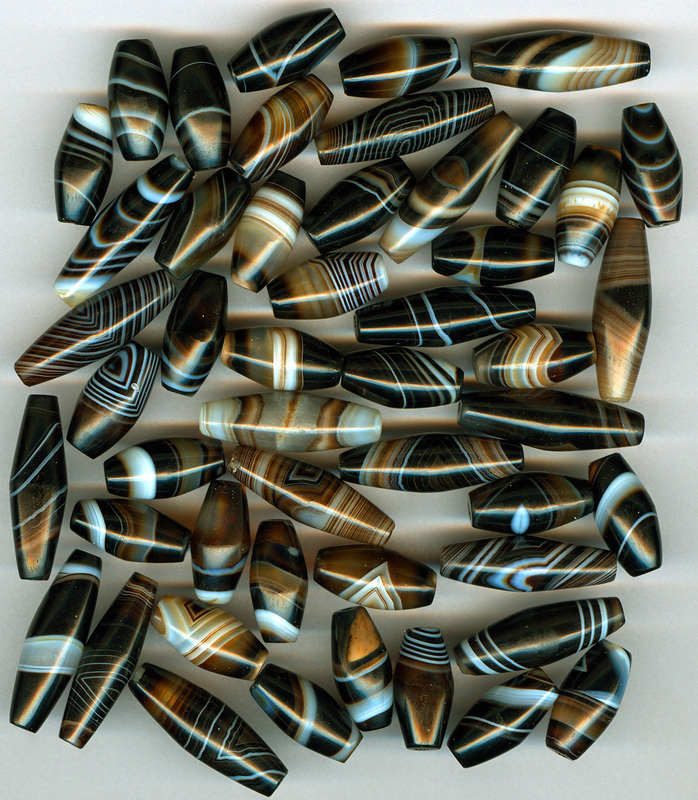 As you have seen on this page they also cover a huge variety of beads. The Pyu city states had an impressively long life. They began around 200 B.C. and declined 1000 years later around 1050 A.D. Contemporary Chinese visitors characterized the Pyu city states as peaceful and affluent. Chinese chronicles note that the young Pyu monks wore silk cotton instead of real silk in order not to kill the silk worms. Even though the Pyu-people as a Tibeto-Burmese tribe originated from the Yunnan province, they soon became deeply influenced by India. Their culture became penetrated from bottom to top levels of society by the Indian Ashokan Buddhism and later by the Guptas. This influence came together with extensive trade. Indian culture was most visible in the southern Pyu areas where most trade with India was conducted by sea. Here the 'indianization' can be observed by the fact that the southern kings at Sri Ksetra gave themselves Indian titles like Varmans and Varma. Both the southern and northern Pyu states were influenced by India. Some of the northern Pyu Kings (Tagaung) claimed that they descended from the Sakya clan of the Buddha. 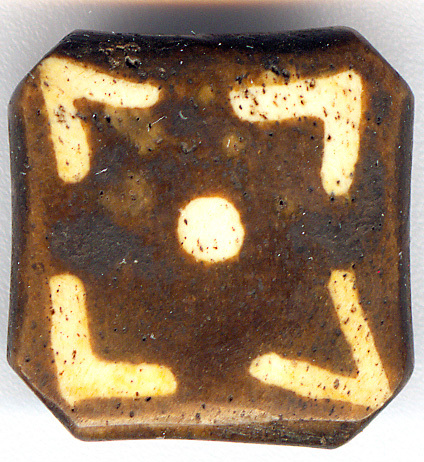 The Pyu city states had a small population. At its height the Pyu numbered no more than a few hundred thousand people. A culture consisting of so few does not have the critical mass required to create an independent society. Compared to India the Pyu city states were very small. The ancient Indian empire had one of the world's largest populations. When Ashoka converted the Indian Empire to Buddhism he was the King of the world's largest economic power. 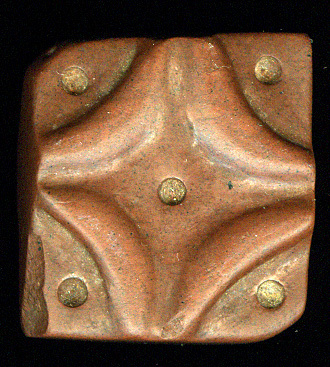 We find evidence of the deep Ashokan Indianization at several Pyu sites. 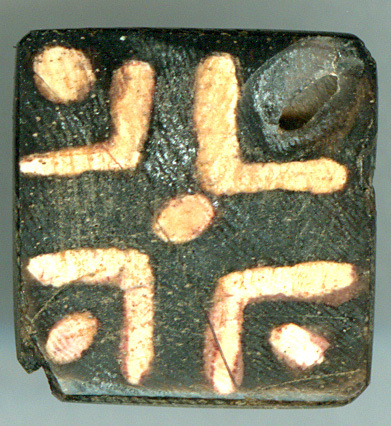 They have yielded a wide variety of Indian scripts from King Asoka�s edicts written in north Indian Brahmi and Tamil Brahmi, both dated to the 3rd and 2nd centuries BC, to the Gupta script and Kannada script dated to the 4th to 6th centuries AD. The thousands of stupas and pagodas in Bagan exemplify an architectural style that is pure Indian Buddhist. Most probably these stupas were built by Indian engineers and architects. The Pyu settlements were ruled by independent Kings, established courts largely modeled after the Indian monarchy, especially the south east of India. Due to the influence of Ashokan Buddhism, Kings were not divine in their own right, but had to be 'baptized' into power by the Buddhist institutions. 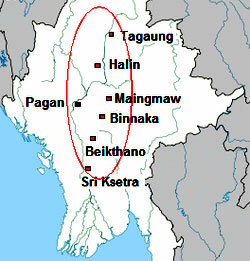 The people of Pyu and the later Burmans followed the original Ashokan empire state Buddhism. Here the monastaries and stately government had gone into a symbiosis where Kings could not exist without being divinized by the Theravadic institutions. Since the beginning of the Pyu culture and up to the English conquest of Mandalay in 1885, the Buddhist monks have been central to the Burmese kings. The monks sanctified the rulers by making the right endorsing rituals that divinized his right to rule. As a return the royal families supported and financed the Sangha. This system slowly vanished in India with the rise of the Sunghas. In Burma it continued until the English in the last Anglo-Burmese war in 1885 crushed the royal classes in Burma. like the Burmese lacquer art. 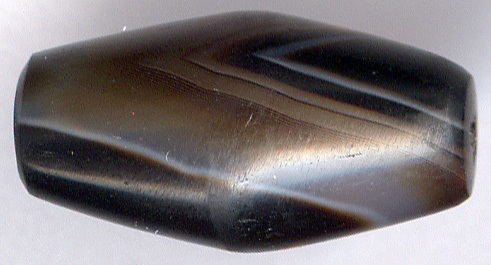 After many layers of lacquer you arrive at an innermost core of animal horse hairs. Basically the Burmese culture is still animistic in its deepest core. Burmese Buddhism can only be understood in this animistic context. 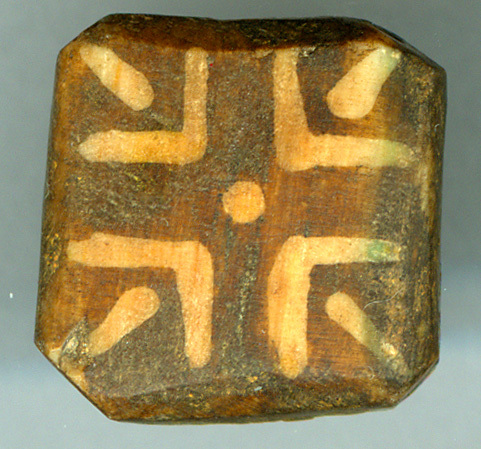 The bead culture and especially the magic understanding of beads must be seen must be understood from to basically opposite spectrums: Animism and Buddhism. 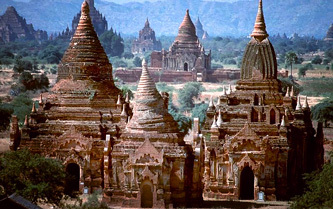 Later, around 800 AD, when the Pyu culture slowly was overtaken by the Burman culture, starting from Bagan, the new rulers, like seen so many times in history, forgot their own culture and started to sample the culture they had defeated. 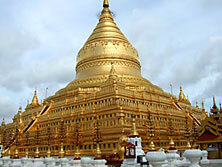 A clear example is seen in the new Burman ruler, now with a new entirely Indian name, King Anawrahta, when he in 1044 stated his conversion from Ari-Buddhism to Thervada Buddhism with building the Schwezigon Pagoda. This pagoda is built in typical Pyu architectural style. The Pyu civilization and the later Burmans were Buddhist cultures. However, like big brother India, they had a large and respected Hindu minority. Sadly much of the evidence of a thriving Hindu culture has been destroyed after the military coup by in 1962. In Bagan there were several hundred ancient large Pyu Shiva-lingas before the military started systematically to destroy them in order to clear out all Hindu culture from Burma. At the same time millions of Indians who resettled during English colonialisation, were forced out of Burma by the new military dictators. The same thing happened to the bead production. It was overtaken and copied by the new Burman rulers. 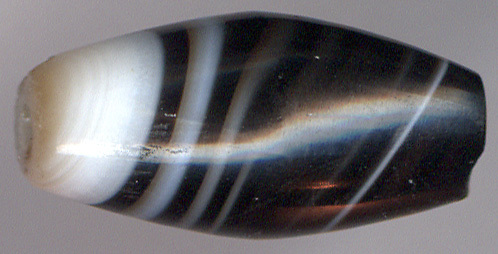 Hence it sometimes can be difficult to ascertain if a bead is a genuine Pyu bead or a bead made by the later Burman's of Bagan. I talked to some Burmese people who have based their livelihood in searching for beads. These people are so far the most knowledgeable bead experts I have encountered in my time as a bead hunter. They told me that for them it is quite easy to tell the difference between a Pyu bead or a later Bagan-Burman bead. 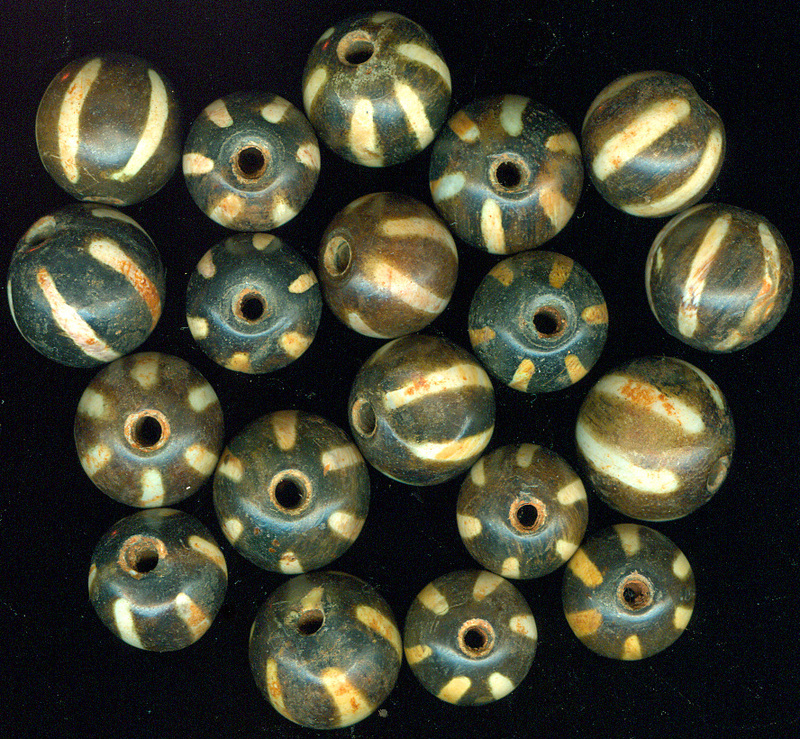 After the decline of the Pyu-period, the art of bead making declined simultaneously. So the Pyu beads definitely have their own identity and artistic beauty. However one should not forget that the design of these beads, together with the beads themselves came as bearers of cultural and religious signs from the Buddhist heartland India. 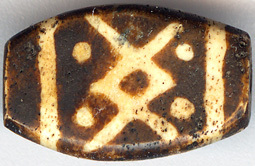 When we look into the design and symbolic meaning of Pyu and later Burmese beads, we have to consider this well documented relation to and dependency on trade with India. Also we have to take into consideration, what is somehow forgotten: India was a Buddhist country at the time of the Pyu civilization. All beads from this period and even later have to be understood in the light of Animistic Indian Buddhism. Today Pyu bead culture is often seen as an isolated phenomena, in the same way as Ghandara art has been wrongly viewed as a culture belonging only to Afghanistan. Ghandaran art was not merely a local expression of art. It was a part of the thriving State Buddhism of Greater India. Displayed below are some etched beads I sourced in Bagan. 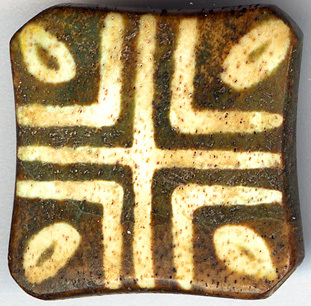 These beads have the exact same design as the ones I found in Northwest India and Pakistan. As so many times before, we can see beads as travelers. On one hand they lose their history by traveling, on the other hand they create history by traveling. Are the Pumtek beads ancient? In the beginning of the Pyu culture there was no distinct and outstanding bead culture in Burma. Like the architectural styles of the pagodas, the life of the Kings and so on, it was all a sample of the culture of the Indian Buddhist neighbor. Hence the earliest beads we find in Burma are beads with pure Indian design, either made in India or by Indian influenced craftsmen living in Burma. Only later the different tribes of Burma found their own style and art of bead making. This is exactly what happened with the stupas and pagodas in Burma. In the beginning, at Bagan they were pure clones of Indian architecture. Later, when the Burman culture expanded and influenced neighboring tribes and areas, Burma did develop its own stupa and pagoda style. 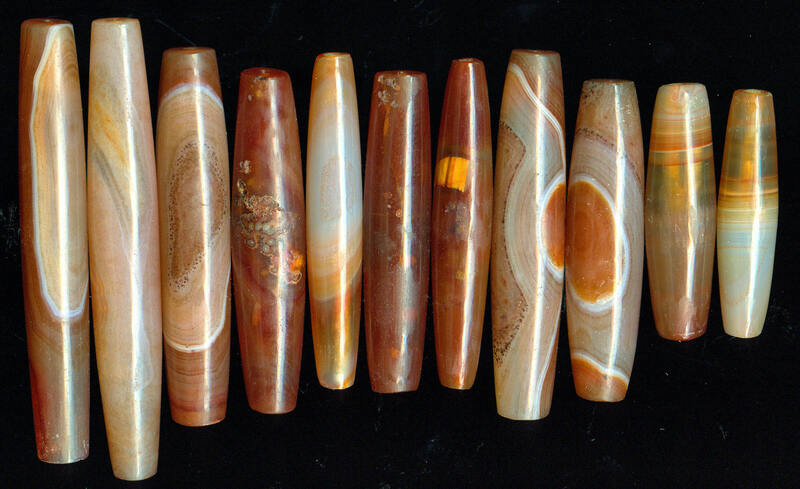 One of the main features that characterizes Pumtek beads is that they are made out of petrified or agatized wood. 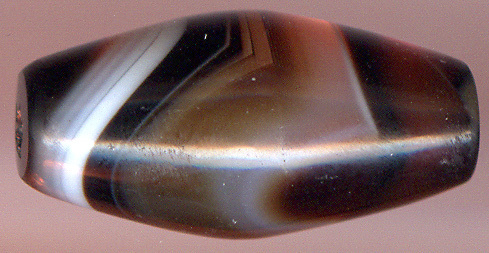 India does not have petrified wood like Burma. 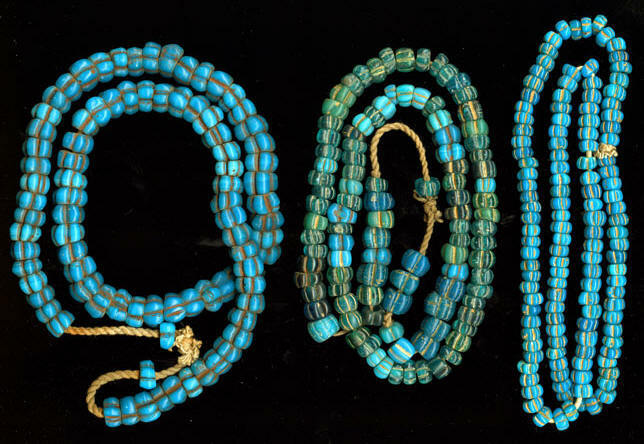 Seen in this light the Pumtek-Chin beads represent a later, 'customized' and more independent development of Burmese bead making, taking place not at the old power centers of Burma, but later at the outskirts of the country. I do at the moment not have enough evidence to prove this hypothesis. It is only what one could call a working model. 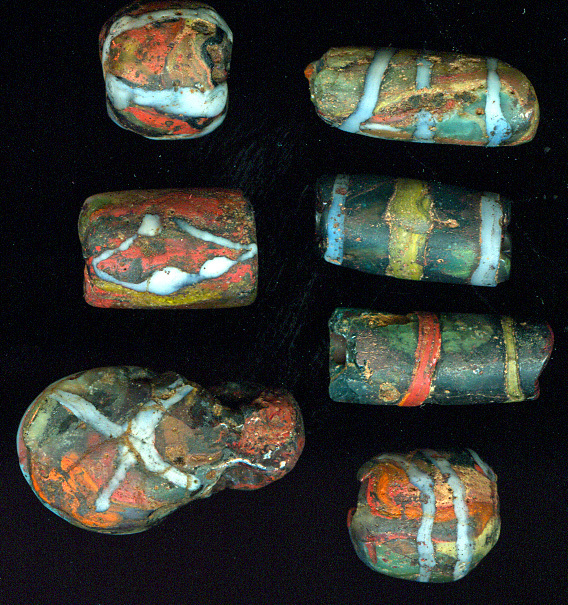 However, seen in this light the Pumtek-Chin beads are not as old as claimed, at least not more than a maximum of 1000 years. 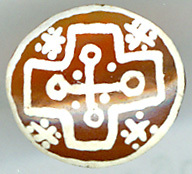 One of the most frequent symbols on the Pyu beads is the cruciform. originate from the Pyu culture. It came as a messenger of Buddhism from India. 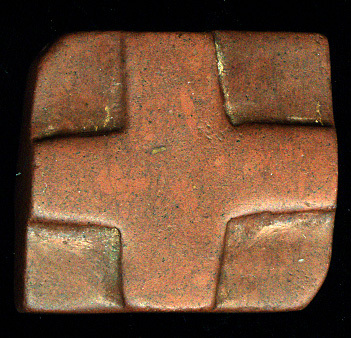 The cruciform was one of the most important symbols of early Buddhism. Most stupas and pagodas incorporated the cruciform in their architecture. 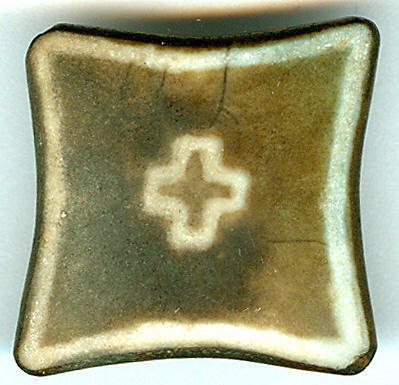 Just as an experiment I showed several intellectual Buddhist monks in Myanmar some cruciform beads as the one displayed below. My question was: What is the first thing that comes to your mind when you see this symbol? Most of these monks had never seen these cruciform beads before. Their answers were like I had anticipated. This symbol depicts the four noble truth of the Buddha... This symbol depicts the mission of the Buddha, like seen in the Ashoka pillar. Again we witness the strong influence from Indian Buddhism. 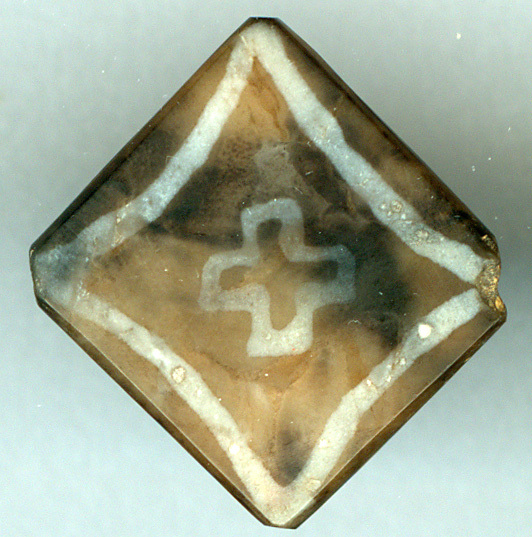 This pre Christian cross was the 'logo' of the famous Buddhist University at Taxila in North West 'Greater India'. Below you can see a bead from Taxila in Pakistan. It is my firm belief that the patterns depicted on etched beads are a simple sign language that has its root in a Buddhist culture. These simple signs could, like the simple mudras of the Buddha, unify all the Buddhist societies spread along the enormous distances of the trade routes. These different Buddhist cultures had different customs and different languages, but they were able to unify in the understanding of the humanistic messages of the Buddha, messages of tolerance and human understanding so important for the upholding of the trade routes. You can read more about this subject here.